1. Cook spaghetti according to pack. 2. When cooked, drain, reserve 2 tbsp water from cooking. Put water and drained pasta back into the empty saucepan. 3. 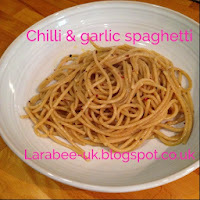 Put on a low heat and add olive oil, crushed garlic, chilli flakes and salt and pepper to taste, heat through and serve. Enjoy, preferably with a glass of wine but it is a weeknight so that's not mandatory! Really yummy, cheap (ahem) and easy.